Let's see ... 50% early bird discount from an already low price (500 for 2 days, 250 for 1, discounted to 250 and 130 for the next two weeks so act fast), a full version of Visual Studio Professional, a full version of Expression Web, the DVD set from Tech Ed 2008, and a coupon for $100 off a DevTeach registration. That's not counting the eval versions of VSTS and Expression Studio. Holy Smoke, this would be a cost effective thing to attend if you didn't even go to any sessions! But the sessions are listed, and they are good ones. 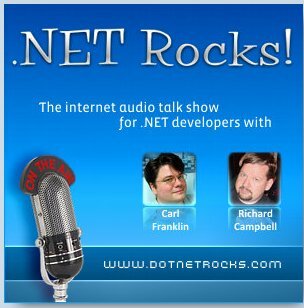 Need to know how to build a real application in WPF? Use the ASP.NET AJAX extensions in your web app? Use controls and styles in Silverlight? Lock down your SQL server? This is the conference for you. Local, inexpensive, timely, ... and a bag of goodies. Plan to be there. And that includes doing a little reading first ... these sessions don't start at "what is this Visual Studio you speak of?" so there's a resource list to get you ready to attend. Richard told me about this "get" a while back but I missed the release of the show. Soma is the senior vice president of the Developer Division at Microsoft, and leads the teams responsible for providing tools and developer platform technologies targeted at developers, designers and teams involved in software development. This includes Visual Studio for professional developers, Visual Studio Team System for software development teams, Visual Studio Express and Popfly for non-professional developers and hobbyists, and Expression Studio for designers. That's a lot of responsibility, and if you use Visual Studio then Soma's opinions matter to you. He talks to Carl and Richard about how he got to where he is now (he's been at Microsoft almost 20 years, and part of the attraction was the Seattle weather, which makes sense if you know he was in Buffalo when he took the job.) The interview is full of behind-the-scenes glimpses into how decisions get made ... a fascinating conversation. Read and enjoy! 10) Stuff that's provably unsolvable, but for which customers demand a solution anyways. Been there, done that, alas no Tshirt. The PDC site is full of announcements (and there will be more in the days to come, based on some emails I've received) so there are even more reasons to attend than before. The number one reason to come to PDC is to LEARN. Well some topics just don't fit into 75 minutes, and attending 3 different 75 minutes sessions by 3 different speakers who may or may not have co-ordinated their coverage is a strategy that might work if you're lucky, but might not work either. Enter the PDC Symposia - co-ordinated coverage of the two MUST LEARN topics this year - concurrency and cloud computing. Don't worry, you don't pay any extra or anything, just choose to attend these sessions on the last day. The second reason to go to the PDC is to GET THE BITS. PDC has always been the place to get the fresh-out-of-source-control latest build of something that won't see beta for a long time yet. It's already been announced that those bits will include Windows 7 and will come on an external drive, not a big stack of DVDs. Cool! The third reason to go to the PDC is to MEET PEOPLE. An utterly astonishing array of executives and wonder-brains are giving the keynotes. As well, the speakers are essentially all internal Microsoft people who've been working to create the technologies they're showing you. And the attendees are a cross section of developers and architects who really care about staying ahead of the curve and learning what's coming before it comes. A single lunch with any of these folks could change your life, or at least your job. Register while you can! And if you see me there, say hi! Steve, a former C++ guy and current PCP guy, tells stories very well... just three of the reasons I like him. He blogs very infrequently, but when he has an update it's worth reading. This one is funny and informative. Plus, it features links to videos of presentations about the Parallel Computing Initiative. I've linked in the past to videos in English that are hosted on a page in French, so I know you can all handle it. Consider it Canadian Content even though the videos are from Paris. Go, read, watch, you'll enjoy it. Billy is one of my heroes. He knows how to solve problem with software and he knows how to speak his mind. Here he is talking about WPF and Silverlight - shiny new ways of making applications, that work best in the hands of someone who's been making applications a long time and knows a thing or two about users and user interfaces. If you missed him on DNR TV, here's that episode. This one lets you see what he's talking about - highly recommended. I love reading Internet histories. Some say it's because I was around for most of it but not so! The Internet was 20 years old when I started using it almost 20 years ago. Here's a nice summary that starts with the idea of packet switching and goes through iTunes, PayPal, MySpace and YouTube. It's a good read. FreeRice is a strange little game that asks you what words mean. Does rejuvenate mean bewilder, pierce, evade, or restore? As you play, it assigns you a score, the higher the better, and also tracks the number of grains of rice that will be donated to the United Nations' World Food Program. If you get a question right, you are asked harder and harder questions. The first time I tried this, I got the first 25 words in a row correct and then missed flagitious. I noodled around for a while and my score was around 49. They say over 48 is rare. Months later, with some time to kill online, I tried it again and my score topped out around 53. Wow. They say "FreeRice has generated enough rice to feed more than two million people since it started in October 2007" although I guess that means two million people one meal each, it's still pretty impressive. And they've added subjects like Math and Chemical Symbols, though I haven't tried those. Give it a whirl, it's fun!